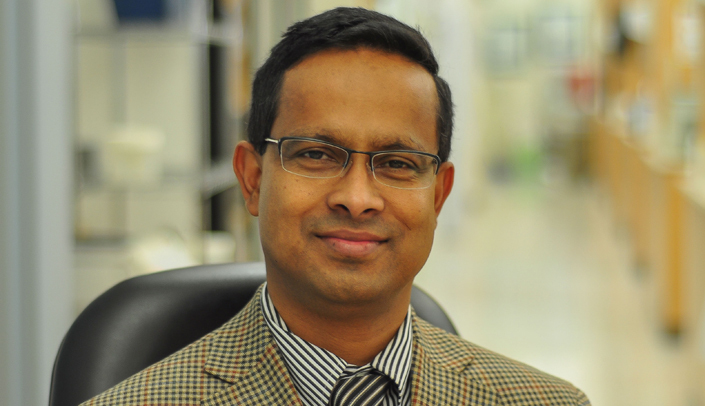 Meet New Investigator KM Monirul Islam, M.D., Ph.D.
KM Monirul Islam, M.D., Ph.D. This profile is part of a series to highlight the researchers who will be honored Feb. 2 at a ceremony for UNMC's 2014 Scientist Laureate, Research Leadership, Distinguished Scientist and New Investigator Award recipients. Name: KM Monirul Islam, M.D., Ph.D.
My research in infectious diseases and patient-centered outcomes combines epidemiology and medicine. This means I get to study early detection and diagnosis, treatment, and outcomes of disease (that's the epidemiology part), especially of infectious disease and cancers (that's my medicine background showing through). My main overarching aim in all my work is to do all I can to help prevent disease in the first place and, if disease occurs, to prevent further spread and ultimately to lead to better outcomes for all, particularly among resource-limited populations. My research on the infectious diseases of tuberculosis and sexually-transmitted infections and on patient-centered outcomes research in cancers, especially lung cancer has contributed to clinical practice. Also, the results of my studies have had an impact on the development, refinement, and implementation of policies, procedures, and best practice guidelines in the fields of epidemiology, clinical health care, and patient-centered outcomes research. Be ethical and work hard while balancing family life. Favorite main dish is fish. I am so proud of you and happy to be a collaborator! Congratulations, my friend.